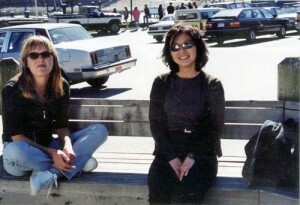 Madeleine and Suzanne meet on Bowen Island in 1999 during a Leadership Vancouver retreat. 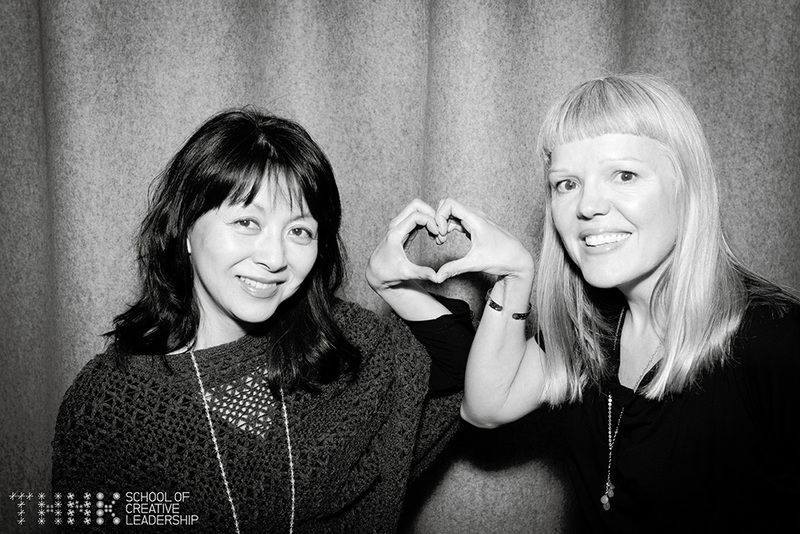 We met as participants in a Community Leadership program called Leadership Vancouver in 1999. Madeleine had just closed the garment factory and boutique – everyware designs – that she had operated for three years, in order to dedicate herself full-time to growing Lunapads. Suzanne, following a bout of serious health issues, was getting close to quitting her job as a Corporate Controller. We were just kind of instantly fascinated with one another, and were assigned to work as part of a small team on developing a marketing plan for a non-profit dedicated (no accidents!) to increasing girls’ participation in sports. This experience allowed us to get to know one another in a working, project-driven context. Leadership Vancouver also introduced us to Renewal Partners, a local impact investment group. Suzanne offered to help Madeleine prepare the necessary financial statements to pitch Renewal as investors, and ended up become a shareholder herself (along with Renewal!). What are your tips for a successful business partnership? 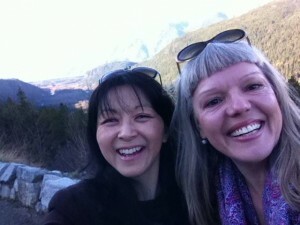 On the way back from Not Business As Usual documentary screening in Whistler BC, Spring 2013. #1: We’ve always based our partnership on one driving principle: the relationship comes first. It comes before money, titles and ego. We’ve had our share of miscommunications over the years, but we’ve always had the integrity and courage to keep the lines of communication going and call each other on our missteps. We often say that our ventures feel like conversations that we just keep having: we never get bored, or too frustrated, no matter how complicated or stressful it can get. The secret for us is to check in (often!) and be honest. #2: We like to say “Trust is like play-dough: you can build anything with it”. We’ve been building a foundation of trust from the outset. We also have a profound level of mutual respect and are willing to laugh together, and at each other, knowing that we have each other’s best interest in mind. Tearing out baseboards and painting Lunapads first office in 2000. #3: We are both willing to be extremely self-aware when it comes to being in fear and ego. During a particularly stressful period of our lives, we hired a counsellor and learned about how we each react when we feel stressed. Knowing this was a “lightbulb” moment, as it helped us understand why we were behaving in our own way. We are willing to forgo ego and say things like: “I’m scared that I no longer bring value to the company”, “I don’t know how to do this”, “I’m sorry that I said/did that”, “I’ve thought about it some more and have now changed my mind”, “I feel I’m letting you down” and so on. It’s about humility and ruthless honesty. #4: The other side of this is ruthless compassion: we never lose sight of the fact that we are just people, trying our best with what we have. We will probably screw up, fall short, or face some serious curve balls in our personal lives. Instead of feeling resentment or anger, we practice compassion. We ask each other how we can be of greater support. Ultimately, we always go back to what matters most: the relationship. It’s not always easy, but it always goes back to trust. How do you make decisions? Do you ever disagree? “Disagreement” is actually a super-interesting place for us, that can often yield some of our best results. After all: we think very differently (our Meyers-Briggs profiles are diametrically opposite) and come from very different backgrounds (Madeleine: Right-brain dominant, multi-generational Settler-Canadian; Suzanne: Left-brain dominant, First-generation Chinese-Canadian). Rather than seeing our different perspectives as being inherently opposed in a traditional binary power dynamic of right/wrong, win/lose, we see ourselves as bringing different parts to an evolving whole that is far greater than the two of us. If we don’t “agree”, we take it as an indicator that we are not at the end of the conversation or done with adding the various more pieces into the mix. When we disagree, we also become more curious and check in with our “gut” about why we may not be in alignment, or what might be missing. Maybe we’re not asking the right questions, need help or more time, or are both wrong! Another practical tip is language. When having intense conversations, we have learned to replace the word “but” with “and”. When we are truly stuck, we ask for help (we have two amazing Advisory Boards, and tons of brilliant colleagues) and otherwise we just keep talking (sleeping on it helps too!). Quite often, we have found that the process of going back and forth yields a better result that we could not have come to separately. Finally, a helpful perspective shift we adopt when making decisions is just to take an initial step or temporary decision, and see how it works out. This way, the pressure is reduced, and we allow space for what our customers or other forces may want us to do: in other words, to get ourselves out of the way to see what wants to happen, as opposed to the other way around. While this works for us and our flexible personalities, we know this process isn’t perfect and will not work for everyone. 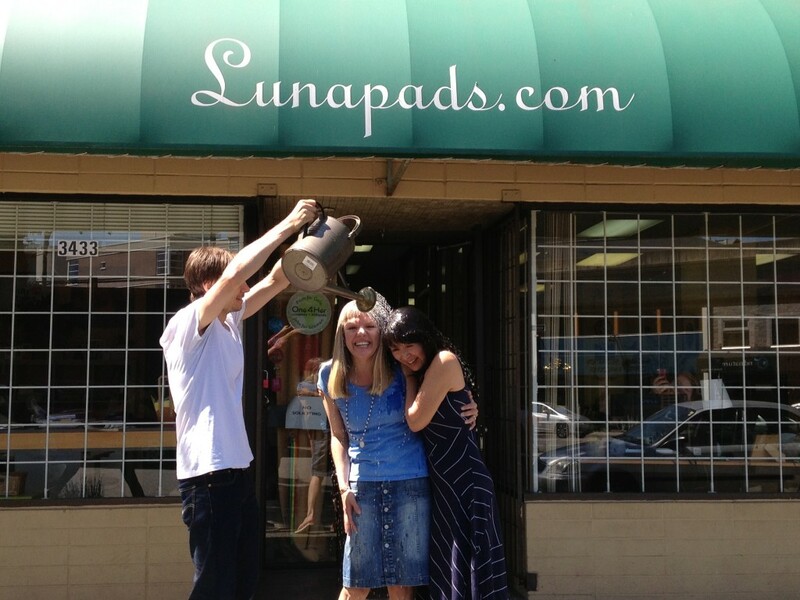 What are your respective roles at Lunapads and United Girls? Most of Madeleine’s time with Lunapads is spent creating content (blog posts, reports, copy for award applications, media releases etc.) and (see question 3) talking to Suzanne about overall strategy and vision. Getting prepped (soaked!) for SO IT IS: VANCOUVER book photo shoot, August 2015. Suzanne and Madeleine are both Directors (along with 3 others) of the United Girls of the World Society, where, again, Suzanne maintains the financial backbone. In 2014 and 2015 Madeleine spent most of her time developing G Day, designing the program, approaching Sponsors and Presenters and working with Community Leaders in cities other than Vancouver. United Girls is a team of three including Madeleine.